Last week I was listening to an NPR episode about the “hottest new trends” in the Chicago food scene at the moment, and to my surprise Caribbean food is currently at the top of this list. According to this broadcast, there are a number of new Caribbean restaurants opening up in the near future across the city of Chicago and the journalists were debating if Caribbean food would be the next trend, like “Brazilian” food was in 2005, or if it would be a lasting phenomena. Regardless of that debate (I mean, who knows right? 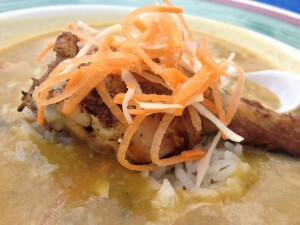 ), the broadcast did get me thinking about “Caribbean” cuisine; what is it, really? The Caribbean, as an area of the world, has such a complex history marked by European colonialism, which obviously affects its current state of food. The Caribbean cuisine is influenced by the Dutch, the French, the Spanish, and British, which all conquered various parts of it. And if this is the case, food wise – Caribbean cuisine is awesomebecause here we eaters have the best of both worlds – traditional French sauces with a sugary, tropical twist on top of fresh seafood directly sourced from the nearby ocean, and rice, traditionally from Spain, but made with tantalizing spices and fresh herbs from the Caribbean. Delicious. Being the trendsetter that I am (ha-ha), I recently went to the Dominican Republic on a week-long adventure with my better half. We went on an all-inclusive vacation and although the beaches and natural beauty were amazing, the food was, well, very blah. Being the foodies that we are, we convinced a staff member of the resort, Tito, to be our tour guide into nearest town of Baihybe (pronounced buy-e-bay) and take us out to lunch. After a stroll through this very stereotypical “other world” town, we ended up eating lunch at a place with no name, but it was the best meal we had the entire trip. 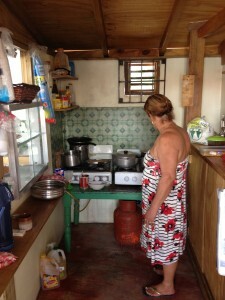 We were greeted and served by Esperanza, a native Costa Rican who studied the culinary arts in both France and Italy, with what she ensured us was a “classic Dominican Dish.” We chowed on a deliciously braised Dominican chicken dish with habichuelas, which means white beans in Spanish, over rice, and pescado con coco (fish with coconut), which were extremely fresh and served whole. To top off the meal, we had ice-cold Dominican beers…it was amazing. We had such a great meal that I came in the next day and worked with her in kitchen to see how she prepared each dish and upon returning home I made it for TableXi. Hopefully, we will see some more Caribbean food popping up in the city, but until then I can just make it for you. Bon Appetite.